Westlake Avenue. Credit: SolDuc Photography. This is the second of three posts in our series about the latest designs for the West Seattle and Ballard Link extensions. This post covers Uptown and South Lake Union. Last Wednesday, September 5th, Sound Transit released its latest concept work on the West Seattle and Ballard light rail extensions. We’re examining each segment in-depth, from north to south, station by station. More detailed information, including Sound Transit’s score of each station site and track segment, can be found here. Sound Transit’s new outreach website has visualizations and other information. Read Part One here. Since the Level 1 alternatives, there have been a few changes. The all-Mercer St. alignment, the 8th Avenue First Hill Stop, and the idea of having only one stop in South Lake Union have disappeared. Credit: Sound Transit. Click to enlarge. The underground Uptown station will sit in a neighborhood dense with jobs, residents, and events ridership. The station will lie on an east-west, tunneled track segment roughly on the axis of 1st Avenue N. The question is whether the station will be built on Harrison, Republican, Mercer, or Roy. Sound Transit identified four factors in the ultimate decision: tunnel and portal alignment, service for Key Arena & Seattle Center, bus integration, and TOD potential. Roy scores the lowest by those metrics. Bus integration and Seattle Center service would be poor, though there is more upzoning potential near the station site. Harrison scores well on those factors, but has a significant engineering challenge: it would have to tunnel directly under the soon to be renovated Key Arena, which has a deep, excavated bowl, and deeper foundations. The ultimate location will take those concerns into account, but engineering will likely be a bigger factor. The Ballard alignment will dictate the location of the west portal of the tunnel, as will the station to the east. The location of South Lake Union stations will carry equal weight: that neighborhood is also dense in jobs and housing, and growing fast. SLU will have two stations. One will be near the intersection of Denny and Westlake, and the other—which has a wider variance of sites—will be to the west, near SR 99 and Dexter Avenue. ST seems to prefer either Roy or Harrison; Republican doesn’t serve both sides of the highway, and will be hard to integrate with SR 99 bus service. Harrison would provide the best integration with bus service, and be close to the Gates Foundation campus. Roy would best serve the dense neighborhood on the east slope of Queen Anne centered around Dexter. The walkshed of the Terry and Denny Westlake stations is nearly identical. The main difference is the relation of the stations to the slope of Denny Hill, and their potential for transit integration. The Denny Westlake site could have entrances higher up the slope, but the construction would disrupt streetcar operations and choke the already-congested Denny Way. Terry would avoid those problems, but would make for a more difficult bus transfer environment, and would require a hillclimb or escalators to serve Denny Hill. From Denny, the line will intersect with the current Westlake station, the first transfer hub on the line. The new downtown stations are controversial. We’ve covered the siting of the Midtown/First Hill station here; the most likely alignments are on 5th or 6th Avenue. We covered the Chinatown/International District site in depth here. A battle is brewing between community groups, who want the station to be built on 4th Avenue, and Sound Transit, which seems to prefer 5th. Most likely, this station will be the southernmost transfer site between West Seattle-Ballard trains and the rest of the system. The right of way that serves the station will be dictated by the location of the Chinatown/International District station, which we covered here. There is a small chance that the station could be sited on Occidental Avenue, to the west of the current alignment. However, the line would have to fly over the port and industrial areas, and the right of way would disrupt freight mobility on Occidental. Sound Transit seems to prefer an alignment on or near the E3 Busway. Next, we’ll look at the West Seattle segment. Updated 12:16pm for clarity – Ed. Why is this line skipping Stadium Station? That doesn’t make any sense to me. Also, the Denny station should be right in the middle of Denny with entrances on both sides of the street. The following station should be between Aurora and Dexter with easy access to buses both streets. I look forward to seeing the plan for Westlake. That will be a huge and complicated project. The southern station is best, to help fill the gap between Westlake and Denny where high-density Belltown is. There isn’t a single location on Westlake which would be convenient for the vast majority of Belltown. A good connection to the #8 bus would be better. It’s short-sighted to skip the Stadium station. Especially when games and concerts get out, huge numbers of people come in compressed time periods – that is when light rail is particularly well-suited to moving large numbers of people. With extensions to Federal Way, West Seattle, Ballard, Northgate/Lynnwood, we can only expect more people to use transit to get to events at Safeco Field and the CenturyLink events center, so making that convenient, and in particular using both lines for egress seems like a natural. If ST sets its mind to it, they can construct a Stadium station on the new line under any of the alignments, it could even be integrated into a tunnel portal as is being done in Bellevue. Obviously easiest in a surface alignment but really any option can have a station to the south of Royal Brougham. The Occidental location for SoDo would open up that area for more intense development and would also provide a transfer point for an eventual First Ave South extension of the City Center streetcar line, if that gets built. That could go from Starbucks to Seattle Center, connecting to Link at both ends. Yes it seems short-sighted. Given the hundreds of millions that we will spend on massive parking garages that will become less usable over time (self-driving vehicles and ride-hailing), it would seem more cost effective to build optimum connections at destinations. Also, doubling the number of platforms would ease train and platform crowd surges. Since it’s a regional draw, the funds shouldn’t come just from North King. One HUGE advantage of doing the Seattle Subway 1ST Ave. Link alignment: the “Actual Stadium” station on 1ST Ave. Not likely to happen, unfortunately. Nevertheless, the to ID station is not too far esp. for occasional events. Whenever I rode the train and there was an event going on, at least half of the event people actually use the ID station. Having *four* stations on the same street in SODO would be a huge waste, especially if two of the stations are just duplicates of the existing ones. There are *plenty* of better things that can be done with that money–like entrances on both sides of the busy road at U-District and Roosevelt, and *escalators* at Lynnwood Link stations (subarea equity is an issue on that last one). I don’t see how you get there. It doesn’t matter if the new IDS platforms are under Fourth or Fifth, there is no easy path to Occidental. If the station is under Fifth as ST seems to want, it then has to be deep enough to under-run the existing Green Line tracks and the tunnel has to snake through the supports for the Edgard Martiez, I-105 structures. Ditto if the platforms are under a rebuilt Fourth Avenue, because the tracks would have to under-run the Red/Blue line to the north of IDS. Grant, with a platform under Fourth you could conceivable turn sharply at the south end and go to the north of the Clink, though that puts you under First Avenue rather than Occidental. You could jog over south of Safeco. “Stadium West” could then be right between the two arenas for maximum coverage. But it would be mucho dinero. I guess it’s actually I-90, isn’t it, not a “stub”. And obviously, “Edward Martinez”. And, actually, if you did the north of the Clink option, just go down Utah in the air and put the Starbucks station right in front of the door. KISS. Stadium Station was political in the first place. Intl Dist is within walking distance of the stadiums. Stadium Station was about having a dedication station to help marketing. Stadium Station is more convenient for Safeco. An expanded Stadium Station with better accessibility would be even better. I was thinking the same thing, Mike. I believe Stadium is our lowest performing station. Yes, it is farther away from Safeco Field, but baseball is a summer, fair weather sport. People will walk a little ways to the game. I think the best thing to do is build the line so that you can add a station down there later, in case more things are added. But for now, it really is no big deal that we don’t have a stop down there on one of the lines. Safeco is single-purpose stadium with an expensive retracting roof. At least the CLink is a two-sport stadium and has an exhibition center too. It may not help much for ridership but I think it’s a very good thing to have a Link station right next to the Greyhound Terminal. Safeco Field hosts 81 regular season MLB games. This year 4 heavily drawing concerts. Usually various high school and some college games. Next year some exhibition games. CLink has 8 regular season NFL games and 2 preseason games. I don’t know the number of Sounders games but Safeco Field must have 3 or 4 times as many dates as CLink. The exhibition center is closer to the Stadium station than ID. The parking lots north of CLink are slated for redevelopment so it’s quite likely that the walking route from ID across the Weller Street bridge will be disrupted again. ID to Safeco is demonstrably longer than Stadium to Safeco. Since the baseball season starts as early as late March and can go into October, it’s not all fair weather. It’s one thing if there was extensive new routing or tunneling required, but all the options have the lines daylighted or daylighting near Royal Brougham, so the new line can definitely have a Stadium station at a relatively minimal cost. It’s true that if you divide the ridership there by 365 days it may be a poor performing station – but if you look at event days, on event days it is an important station. And truth be told, eventually the bus base sites should probably be redeveloped into more intense uses, no different than the old Fifth Ave bus barn site near Seattle Center. This lays the foundation. Maybe it would have been better for the King County Council to invest in Stadium Station upgrades as part of the 135 million to Safeco Stadium. One of the pro arguments for the money was increasing parking in their garage. If the county pushed, some of the parking enhancements could have been used to make Stadium Station more accessible to the fans. If more people use the station, less money needed for parking. Link predated the Greyhound station. Greyhound got displaced from its old station at 9th & Stewart because of a hotel project, and it chose to relocate a block from Stadium Station. The issue is station spacing. I’ve said elsewhere that high-capacity transit should serve stadiums because that’s where large crowds are concentrating. But I also believe that Link stations should be a mile apart outside downtown, and Intl Dist to Stadium is very close together. It may be a longer walk from ID to Safeco than from Stadium to Safeco, but what should the maximum distance be? 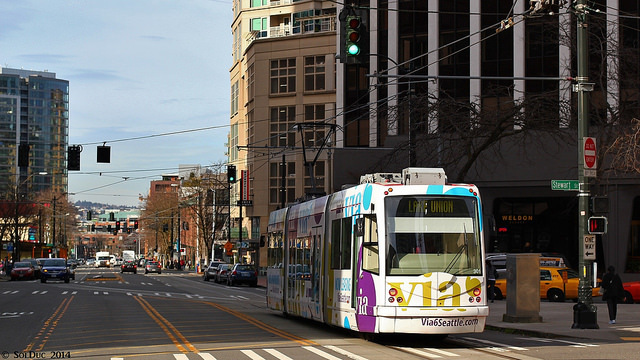 If ID is too far away, maybe we need to think more about that 1st Avenue Streetcar to SODO idea. For the Denny stop, it’s worth throwing out there that there is currently a 43 story tower planned for the John St overlook (not sure if that’s what it’c called–between Terry and Boren) that includes a 24-hour elevator large enough to serve bicycles. This may help pedestrian mobility up the hill, even though it’s a block off of Denny, though it doesn’t solve the problem of crossing the freeway. For the Uptown station, I still think the representative alignment along Republican is the best stop placement. The block of Republican between 1st Ave N and Warren has no driveways, (the only necessary vehicle usage is loading for the Northwest Rooms, including for concerts at KEXP. You could easily block the whole block off for pedestrians, with the limited vehicle access handled by the same retractable bollards they use at other Seattle Center entrances. It would allow for a safe pedestrian queuing route along Republican and August Wilson Way, a second set of station entrances at or around Queen Anne Ave, and would allow easy bus transfers in both the north (1st Ave N) and south (Queen Anne Ave) directions. How much can we mix and match these stations, or is the choice between the various colored lines? We can say anything we want in the feedback. I don’t know what engineering limitations underlie; e.g., combining the southern station with the Republican alignment. From the map it appears none. There’s some mixing and matching that’s feasible (though ST seems to be resistant). The exception is the blue option; the station is moved south from Denny because a TBM can’t make the turn to a 99/Harrison stop. 99/Harrison has the best bus infrastructure, including HOV exits, so that might require sliding the station some to accommodate the turn. It seems like the only problem would be between the second and third station. It does seem possible though, if the train curves a bit north, then curves around to head south. But that also might be more expensive. That would be my first choice in terms of stations. I’m not thrilled with any of the lines, but I think I’ll write about that on a different thread. Similarly, can we pair Aurora&Harrison with QA&Republican? Oddly, Aurora & Harrison might be the station this all turns on. If Harrison is substantially better than the other 99 intercepts, then that will dictation the rest of the alignment. I see little difference between the Denny stations, it’s just a trade-off between Belltown and eastern SLU, and I’ve got a preference for LQA to be south of Mercer, but Mercer is a smaller street there so it’s not critical. It’s interesting that the turning radius of a TBM (rather than that of a train) is the true constraint. “99/Harrison has the best bus infrastructure, including HOV exits”. Which HOV exits are these? Could 99/Roy be the ideal bus intercept, even better than 99/Harrison? It seems like buses that stop there could travel to the north on 99, or to the south via the new 99 tunnel for any service that runs through there, or to local Aurora / 7th Avenue for RapidRide E or its successor. Is E/W service seen as an issue? Harrison turns into a sidewalk at 5th Avenue… and folks traveling E/W are probably better off staying on Link for one more or one less stop. I’m not sure why Harrison is held up on such a pedestal as the perfect bus intercept when Roy seems like it might actually be better at that. If that also saves $200M, that would pay for some better escalators for sure. >> and folks traveling E/W are probably better off staying on Link for one more or one less stop [rather than getting off at Harrison]. It really depends on where you are going. I think it is safe to assume that there will be fairly frequent bus service on Mercer as well as Harrison. A bus on Harrison will likely go as far as Eastlake, although it could conceivably end at Fairview. I think it is also safe to assume that there will be bus service on Westlake, Fairview and Eastlake as well. So that makes for a pretty good grid in the South Lake Union area. Harrison will be fairly consistent (with a bus running in its own lane over Aurora) while Denny service will be very fast at times, and dog slow during rush hour. None of the proposed Denny stops actually work well for the Cascade neighborhood. The closest you come is Boren. If I’m trying to get to Republican and Yale, for example, I really want that Harrison stop. Otherwise I’m walking at least 8 blocks, or I’m walking a block, catching a bus, then walking at least another block (if I got off at Republican and Aurora) or three more blocks (if I got off at Denny and Republican). The other options are worse. That is why Harrison just works better. It isn’t about the Aurora intercept, it is about the Harrison intercept. Otherwise, you pretty much leave out the Cascade neighborhood, which means that folks headed to that part of South Lake Union will ignore the South Lake Union stops and ride from Westlake or Lower Queen Anne. There are other flaws with the station (assuming it must be built with the blue line) but from the standpoint of actually serving the area (via a bus transfer) it is better than the alternatives. ST can build anything that’s studied in the EIS, regardless of whether parts of it come from different alternatives. Yes! If we can “mix-and-match” I’d go for the Blue Westlake Station (for Belltown access without crossing Denny), the Green (Republican Street) SLU station (for Aurora bus intercept without leaving the roadway to the DBT), and the Brown (Mercer) LQA station with the Prospect portal. If the Prospect portal could be teamed with the Republican and Queen Anne station, that would be even better. The Republican portal puts you in place to run at the base of the Queen Anne greenbelt to the Magnolia Bridge infrastructure and stay out of the depressing middle of Elliott West and the need for a big elevated station for Smith Cove. Just extend the pedestrian overpass of the railroad tracks on across Eliott to a station on its heading. You could even have a hill climb to 9th West and Prospect for the reasonably dense apartments at the top. If the Green Line is NOT to be extended to Shoreline and Edmonds (see other comment) then I would make it more explicitly an “urban” line, with another station straddling 15th West in front of Whole Foods, again with a hill climb up to 13th West. There’s already one beyond to 12th. Further north than Market stations should be urban spacing as well at 65th, 75th and 85th. I really hope they consider how these options will work with a potential HWY 99 subway (lack of a better term, Seattle subway salmon/pink line). In the past they have simply not done this, and perhaps they officially can’t do it, but dammit they should think about it. From my armchair transit planning perspective, I think the salmon/pink line should actually dip down and serve belltown, which doesn’t seem to be the way Seattle Subway has depicted it. I am all for future proofing, but I don’t think we’ll ever see a SR 99 subway. There is just so little gained for the money. It would be extremely expensive (requiring a huge new bridge along with tunnels downtown, etc.). By all means Belltown should have a train station (it should be part of this line, instead of South Lake Union) but the Aurora part doesn’t add a lot of value. You are spending billions and not adding a lot of new connections, nor dramatically speeding up the existing ones. This makes it different than the north end of Link. Rides from the UW to downtown are not much faster (in fact, they are often slower) but the rides from the UW to Capitol Hill are much faster. That is the “new connection” that is much faster. With Northgate Link, you have a lot more of these (Northgate to Roosevelt, Northgate to UW, Roosevelt to Capitol Hill, etc.). An Aurora subway just doesn’t have that. (while a Metro 8 subway and a Ballard to UW subway does). Then you have the question of stop spacing. Either you keep all the existing stops (which would be very expensive) or almost half your riders have to catch a connecting bus just to get on the train. You could achieve the same sort of speed improvement by simply running expresses. Overlay the E with a bus that skips half the stops. That is unnecessary right now, but if we get to the point that the buses simply can’t handle the load, that is what makes sense, not spending billions on something that won’t be much faster for the bulk of the riders. Lynnwood to Northgate Seattle. Checked the bus schedules, it exists but they want 45-50 minutes to make the trip! I’ll wait for Northgate Link (and presumably express busses truncating at Northgate) to consider riding transit to Northgate. Aurora Transit Center to downtown: also 45-55 minutes on the E. (So how *rapid* can RapidRide ever really be?) Far enough from Lynnwood Link stations that dealing with the local bus through the 104/I-5 interchange and making the transfer at MLT may not be much better (although obviously more reliable). Just Googled Bitter Lake to UW: 55 minutes with a transfer. I bet Link could do better even if you had to backtrack from downtown. So yeah, there is value to be added with “Aurora Link”, though it’s arguably not as impactful as, say, UW to Ballard or Metro 8 subway. But cheaper to build elevated up Aurora vs. tunneling the Metro 8? Quite possibly! Metro could bring it down to 30-35 minutes with full BAT lanes and eliminating stations spaced less than ten blocks apart. Of course the BAT lanes are SDOT’s responsibility. Shoreline has already done it. In what alternate universe do you live? If you’re at 43rd and University Way in the morning when the Blue Streaks have their quick access, sure, the bus is a little quicker. But not if you’re anywhere southeast of the Law School. And when Link to Northgate opens no longer even at 43rd and the Ave.
Metro could bring it down to 30-35 minutes with full BAT lanes and eliminating stations spaced less than ten blocks apart. That’s a 33% reduction from 45 to 30 or 44% from 55 to 35 minutes. Given that the buses don’t control the signals, I seriously doubt that you could achieve that. An express as Ross suggests would surely bypass the Winona detour and that would be worth three minutes most times. But ten block stop spacing? That is pretty extreme when people are talking about making North City/Licton Springs into a competitor to Northgate. But the bottom line is that we screwed up on the technology choice. Lynnwood Link won’t be able to handle the loads from north of the City since it’s LRT not true subway. Yes, there are good reasons for that in all the other corridors. But not this one. A parallel line as far as Edmonds/Lynnwood will be necessary before the middle of the century, assuming Chussia doesn’t nuke us. “I seriously doubt that you could achieve that. SDOT/Metro could at least set it as an ideal goal and see how close they can get to it. The planners should have started with a travel-time goal because this is “Rapid”Ride and supposedly a poor man’s subway. Signal priority. Why should a trunk route encounter red lights? North City is at 175th & 15th NE. Where are you talking about? Who wants to turn Licton Springs into a competitor of Northgate? I haven’t heard anything about upzoning the houses on the west side of College Way. OK about North City. I’ve heard people talk about the area between NSC and Greenwood as that, but I may be mis-remembering. And yes, people do want to increase density along Aurora significantly, though it would be long and lender rather than a “blob”. Oh, 105th, 85th, 80th, Winona, Green Lake Way (82nd), 90th. Those sorts of reasons. That is “east-west arterials”. Are you familiar with the Orange Line BRT in LA? It used to have some signal priority (mostly extended-at-the-end green), but that has been disabled. There are so many buses that the crossing arterials were getting snarled. So, even though there’s a law against it, Metra is planning to convert it to LRT by 2050. In the meantime they’re building overpasses (to LRT gradient standards) over three initial north-south arterials with plans eventually to do ten. The thing has at least twenty-five, though, so it ends up being cheaper to convert to LRT than build overpasses for all of them. Now Aurora doesn’t have twenty five major arterials, even if you include all the way north to the County line. But if you’re running buses every four minutes in each direction, you end up hitting the same limits as Link on MLK: the cross-traffic goes bonkers. Grant, a bus doesn’t hold the signal as long as a train does, but the impact is still not negligible. Can’t do another tunnel downtown. It would have to be on Second Avenue and it has been made clear that one can’t go further south than Spring. There are too many big tubes under the dirt between there and Yesler. Maybe Spring is good enough for a southern terminus, but a lot of people would say “What is that about?” And please don’t say, “Turn up the hill!” Second is significantly below Third by Spring and you have to stay above the BNSF, but still duck under DSTT, continue under the new tunnel and then rise quickly enough to have useful stations under First Hill. Whee, an underground roller-coaster! Again, Ross, you’re underestimating the demand from Shoreline and north. Lynnwood Link is going to be full, very full, by 2035. Either the Green Line will have to be extended up 15th and Holman to the Interurban corridor and north into Edmonds or there will have to be a Westlake/Fremont/Phinney Ridge tunnel to that same interurban corridor. The top of Phinney Ridge is a spectacular place for high rise buildings, unparalleled in the United States for natural viewshed. Three out of four sides of any high rise built there would have a spectacular view of the Cascades (east), downtown Seattle and Mount Rainier (south), or Olympic Mountains (west). Heck even the north side would occasionally see Mt. Baker and Glacier Peak and could enjoy the Sound headed off toward Whidbey Island. Build them narrower east-west and stagger them one per block for three blocks on either side of a station about 65th and Phinney and you have created several billion dollars worth of view properties that wouldn’t block anyone else’s views. Because they’re on a north south axis and the hill is steep to the east, the shadows wouldn’t be a huge problem either, though folks in the first blocks should have some compensation. >> Lynnwood Link is going to be full, very full, by 2035. Seriously, what is your example? What suburbs of this size serving cities this size can’t handle the loads with four car trains running every three minutes? Come on man (or really, men). How long has it been since d. p. left this blog? He schooled all of you (and me) when it came to transit. He obviously knew his stuff, and every prediction based on his ideas has come true. Folks were shocked — shocked! — that simply adding two stations in Capitol Hill and UW has resulted in an enormous surge in ridership. How could that be? It is only a few miles, and yet, somehow, magically, ridership has practically doubled. Remember when SeaTac was the most popular station? What is it now, fourth (and declining). Of course there are particulars that effect ridership, but the main factors are proximity and density. Capitol Hill and the UW are close — that is why ridership is so high. People take trips there all day long. They take trips that they didn’t even plan on taking until the last minute. Do you really think someone is going to do that from Ash Way? All of that — every single bit of it — misses the freaking point. In what world is an Aurora subway a great value? Again, serving Belltown is long overdue — I get that (everyone does) and if it was well connected to the rest of the system, then ridership there would be high (much higher than every station in Snohomish or Pierce County). But an Aurora subway would be really expensive, and wouldn’t make that many trips that much faster. Again, what would it look like? Seriously, draw me a picture. Tell me where each and every station would be. Same as the E? Great. But then it wouldn’t be especially fast then, would it. Of course it would speed things up if you eliminate the stop lights and the traffic, but folks take express buses from Queens to Manhattan because long distance subways are slow. And no, B, taking a train all the way from Aurora Village to Westlake and back to the UW would not be faster than cutting over immediately (or even simply riding Swift to 185th and taking the train south). Skip a few stops and you have something that is fast. But then what? Which stops do you skip? The E already skips the obvious ones. By all means we should get rid of the Winona detour (that thing is stupid) but Metro could do that tomorrow if it had any sense. So back to the question — which ones do you leave out? I see no obvious set of stops. Is 130th better than 125th? I suppose so, but then what? You start leaving out stations like 125th and a huge chunk of your ridership is walking a really long way to a stop. Now you are running a “shadow”. Unless you run it as often as the E, you are screwing over a good chunk of your ridership. If you do run it as often as the E, you really haven’t gained anything. All of those riders are still taking the E, or at best making a transfer. Which gets us to the ridership question. So far, ridership on Link has been pretty close to ridership on the buses. The 71/72/73 carried a lot of people (more than the UW station). Buses from Capitol Hill carried a lot of people as well. An E that is marginally faster (assuming it has all the stops) can’t be expected to have a huge increase in ridership. This makes it different than the Metro 8 subway, or a Ballard to UW subway. Both of those proposed lines would enable trips that are not only faster than an existing bus, but faster than driving — at noon! You simply can’t say that about a train that makes stops on Aurora. Which gets us back to ridership. With no huge increase in speed (for any conceivable trip) and no great increase in frequency, you can’t expect a great increase in ridership. Even if we are optimistic, and ridership more than doubles to 40,000 people, it still isn’t a great value. That is a long, expensive line for only that many. In terms of value added (time saved per rider) it is even worse. It just doesn’t make sense to build. Yes, dig the bellmouths and stack Harrison/Republican/Roy to accommodate them. Here are some thoughts: The Seattle Center is essentially a big park. Ridership will not be driven by it, nor does it make much difference if you are a couple blocks away, or right next to it. Someone who goes to a game, or a big festival won’t be swayed by that extra distance. In contrast, someone who commutes every day from their Uptown apartment or to their office in Lower Queen Anne may find an alternative (including driving) if they have to walk too far to the station. Thus it is a good idea to have the station a little at the corner of the park, or farther away. Mercer or Roy seem like the best spots. There are lots and lots of apartments on that side of the hill (something ST inexplicably isn’t considering). The other considerations make sense, but ridership will be driven by the ease with which people can access the station every day. For the SR 99 station, I prefer Harrison. It isn’t great from a walking standpoint, but at least it is great from a bus integration perspective (assuming Metro can put bus stops on both sides of 99). It is also very good for east-west bus service, as soon Harrison will be a major bus corridor (hopefully with its own bus lane). That means someone could ride from Ballard, get off at that stop and ride to the Cascade neighborhood. Even just from a walking standpoint there are more places to access. With Roy (the second best choice) you run into the lake. There also is value in being a bit farther away from Mercer since crossing it is such a mess. With the Denny stop, a lot depends on what the other stops are. The blue line puts two stops very close together, with a big overlap in walkshare. If Harrison and SR 99 is a stop, then the next stop to the south should be farther away, at Boren. I would actually have that stop be even further east (at Fairview) for better bus integration (e. g. Eastlake to Ballard) but Boren is still better in that regard than Terry. For Westlake, the key is the transfer. This will be the most important transfer point in our system — we need to do it right. Since 8th and Madison is out, the best alternative is 5th. 6th is the worst of both worlds — not close enough to First Hill to actually serve it, while being right next to the freeway. One of the purposes of high-capacity transit is to manage concentrations of pedestrians. Events at Seattle Center are one such concentration. You’re right that the can walk further but they do need to be served. I’m not so much concerned about this proposal as about your previous statements that Seattle Center is not a majority of Uptown’s ridership. How can that be when you have tens of thousands of people from all over the region coming to the Center one some days? I went to an event at the Center last year or the year before, maybe it was the women’s march, and the Monorail had a long line of people waiting to get on so I took a Queen Anne bus instead. (How did they handle this during the World’s Fair?) The Stadiums sometimes tie up traffic worse than rush hour does, as I’ve experienced both on the freeway and on a 4th Avenue South buses. Roy seems OK for that station. That’s still close to Seattle Center as I would consider it. But for SLU station Harrison & Dexter has a lot of appeal. That would give it a walkshed with highrises on both sides. There’s a tradeoff between an SLU walkshed and transfers to the E, which I also think are important. But I’d hate to have another highway station with 1/2 or 3/4 of the walkshed cut off. I think the distance between key arena and the station could actually be a feature. The longer walking distance essentially spreads out the peak that hits the station at the end of the game and reduces platform crowding. Seattle Center and the soon-to-be Seattle Coliseum are well-served by the monorail already, which is a tourist attraction in and of itself. Link will make this area more accessible wherever the station goes. Event attendees could traverse couple of level blocks past some bars and restaurants, a distance that is less than crossing a typical parking lot at a mall during the holidays, and that would be fine. As for SR 99 bus integration: I am pleased to see that ST increasingly considers bus-rail transfers relevant to this planning phase. ST (and RossB) seem to think Harrison is better than Roy for bus transfers… but why? Is it really? Harrison is good, but is there a reason bus stops cannot be placed SR 99 at Roy and a station entrance on either side of SR 99? Crossing the Mercer stroad is such an epic pedestrian journey that it’s unfortunate it’s looking like we won’t have a station that straddles Mercer. But at least you can cross Mercer. A station that straddles SR 99 at Roy could be useful. The station mezzanine could serve as an additional crossing of SR 99 for pedestrians and that would actually increase the accessibility of the area. It seems like it might work well. Am I missing anything? As for transfers on Westlake, what is knowable at this point, with the proposed location of the new tunnel? I have a feeling this process will quickly preclude good options without knowing we are doing so. Whichever transfers ends up being the least onerous may end up getting overcrowded if ST is not careful. ST has a poor track record of planning for station egress thus far; I’m hoping they are learning from mistakes. To get to First Hill, you just could hop the Madison bus up the hill one, two or three stops. With the bus and Link running really frequently and upgraded buses and stops, that doesn’t seem bad. Agree with beef up the Monorail to serve Seattle Center, and have the Link station be more to serve the neighborhood. The Monorail is already well integrated with the Seattle Center attractions in a way that Link likely can never be, due to the engineering concerns with Key Arena. Well, Madison RR won’t *quite* get you to the heart of First Hill. Suspect it will be more popular for those on the “periphery” of Capitol Hill or the north edge of First Hill, to be honest. Couldn’t see many people walking from Harborview or Yesler to take it (though I could be wrong!). That has been ST’s modus operandi. Study each line in a vacuum, and don’t plan for transfers until late in the process. Harrison is better than Roy from a bus transfer standpoint not because of the transfer to Aurora, but because of east-west buses. For Aurora it is all the same (Roy might even be better). But I doubt we will ever have a bus on Roy, and even if we do, it can’t go over Aurora. But in a few months, as the SR 99 tunnel project wraps up, it will be possible to drive over Aurora at Harrison. It seems likely that SDOT would make one of the lanes on Harrison bus-only, and run a bus from the north end of the Seattle Center over to Eastlake (and beyond). That means that someone could transfer at Harrison and Aurora to a bus taking them to the Cascade neighborhood. That is the value added (whether it is worth it or not is a judgement call). Everyone wants to believe in transit to the airport, because they might ride it a few times a year. The Seattle Center only has a handful of really big events each year (Folklife, Bumbershoot, etc.). They also have the Storm, and may soon have a hockey team along with (hopefully) the return of the Sonics. But add all those events up, and it still isn’t every day. On the other hand, it is common for people to walk to their nearest subway stop and take the train every single day. Having the station close means they avoid driving altogether. The train stop becomes part of their everyday life. Want to catch a show after work in another part of town? Sure, as long as the train goes there. Even if it doesn’t, they splurge and take the cab. But if that initial walk to the train is too long, then it becomes too much of a burden, and they skip it. They drive, or hopefully take the bus. This explains why ridership to the stadium is so low while ridership in urban neighborhoods (e. g. Capitol Hill) is so high. Besides, no matter where you put the station, it is well within walking distance to the Seattle Center. If I attend a game or major event (when parking is terrible) it won’t change my decision making in the least. There may be some reason why I drive (I have to drive down to Olympia after the game, walking around at night in the Center freaks me out, I just love driving) but the extra block or two of walking won’t matter. But if I live in an apartment, there is a dividing line. There is some distance (e. g. a quarter mile) and the subway becomes irrelevant. Studies have shown this (https://humantransit.org/2010/11/san-francisco-a-rational-stop-spacing-plan.html). By pushing the station closer to the Center, you push the station beyond the range of some set of apartments or offices. This hurst ridership far more than having someone walk a few feet through what is essentially a park. I keep mentioning that it is a park because the quality of walk matters. Very few people, for example, will reject Link as an option for getting to the Children’s Theater, while embracing it for a trip to Key Arena since the extra walking is so pleasant. Your “handful of really big events” is missing the multitude of smaller events at Seattle Center, including Seattle Opera, Seattle Rep Theatre, SIFF Uptown, multiple ethnic festivals at the Armory, the museums (MoPOP, Pacific Science, Chihuly), IMax, etc., which make Seattle Center a continuous and not just big event draw. For a number of those events, the monorail provides a closer station than any of the new Link atatiins ever will. Give it some fare integration and some better connections to the rest of the transit network at Westlake and those could be handled pretty well now, with no 20 year wait. Monorail is good for the next few decades, but it’s currently falling apart – I don’t think it’s a good idea to depend on the monorail for the next 80 years; I think it’s better to view the LQA & SLU stations as a replacement for the monorail, as the monorail is well past its useful life. Also, Link is better suited than the monorail for large crowds associated with big events. No, I didn’t forget the small events. I am just saying there aren’t enough of them. Again, folks can easily see themselves using the train to attend the events, just as they see themselves using Stadium Station to attend a Mariners game. As was pointed out above, the Mariners play a lot of games there (and had pretty good attendance this year) and there are other events there as well. Yet despite all that, Stadium is close to the bottom in terms of attendance. More people walk from their apartment (or house) to get to a station. Again, I also feel it is important to note that putting a station at Roy does not mean that the Seattle Center isn’t “served”. You have the monorail, and even if we let it crumble into the ground (which seems unlikely) folks are willing to walk a few blocks for an event. Again, I really don’t think it matters at all when people are deciding whether to drive or take the train. Link goes right to Husky Stadium, and yet some people drive. If Link was closer to the main part of campus, people would still ride Link. As long as it is within a quarter mile walk (or so) to the edge of the Center, they will walk. The best thing to do is make sure that more apartments are also within that quarter mile circle. The monorail was not adequate after the women’s march, and there are probably long lines for it after other large events. It’s capacity is not that large. I don’t know how well it handled the World’s Fair crowds, but the region’s population was a third the size then. It’s the other people I see filling the train on soccer, football, and baseball days. High-capacity transit should fulfill the needs of the masses going to work and their everyday trips, and move people to/from places where large numbers of pedestrians tend to crowd, meaning stadiums and airports and downtown and colleges and shopping malls, and regional multimodal destinations where they serve as connectors and serve visitors who don’t know much about the city and want something easy to find and hard to get lost in. On game days I see more traffic than in rush hour. That tells me that there are still a lot of cars that can potentially be replaced by transit as people’s attitudes change and Link gets more built out. Lower QA: My vote would be Mercer. Republican or Harrison are a bit low on the hill for most activity, and I agree about the concern with Roy. It’s also a good compromise between Seattle Center distance and distance to potential upzones. Speaking of which, we should upzone the hell out of the area – from a transit perspective it’s wonderfully connected to downtown even before it gets light rail. Bit low on the hill? I’d say lower the better – the hill is mostly 2~4 story residential, while Lower Queen Ann itself is being redeveloped with mostly 6 to 7 story buildings, moving to 8-stories with the MHA re-zone. There will be much more activity – jobs and housings – south of Mercer than north of Mercer. Aside from the structures immediately on QA Ave, the neighborhoods turns to SF homes pretty quickly north of Roy. Mercer & QA Ave might be the cultural center of the neighborhood, but it’s not the geographic center. Also, walk-shed isn’t just about distance, it’s about time to walk to a station. The walkshed is pretty limited north of Roy because of the steep hill. That area is the viewshed for a big swath of the south slope of Queen Anne Hill, Kerry Park, the Space Needle, etc. so turning it into the next Denny Triangle doesn’t look imminent to me. In contrast, the thing I would upzone the hell-out-of right now is Northgate, which is as close to a blank slate as cities ever get. Northgate Link is so close now it’s going to beat any new high-rises to opening, with nobody’s view to block. The privately-owned but subject to city zoning Northgate Mall should be a forest of high rises, if the market supports them, which I think it will, and the city should use this zoning as leverage to fund more affordable housing on a bigger scale than we’re doing now. Why we are foot dragging on any of this is a mystery to me; I think it’s just a lack of leadership as I sense no resistance. +3000. Go BIG at Northgate. We should also not ignore the fact that it doesn’t need upzoning. Population density in that area (especially just north of Mercer) is very high (for Seattle). That is really why I have no problem with Roy. My only concern is really the hill — walkshare might be limited because of that. But in terms of density it is great, even before any new buildings are built. I also don’t see much of a problem from a bus integration standpoint. Buses run down the hill (past Roy) or they could turn around there (e. g. the 8). The only bus that would turn on Mercer would be a bus headed towards Magnolia or Ballard, and connecting to that bus would occur further north (if the bus even runs that way in the future). It is an extra block of walking for folks headed to the Seattle Center, but it is an easy, pleasant walk. I can’t imagine anyone deciding to drive to the game or festival just because of that walk. Just to be clear — I’m OK with Mercer as well. It seems like it is just a little bit better (because it is farther away from the hill) but Roy seems very good as well. The hill is why density is so high now, because you can build multistory apartments without blocking the view of the house behind. We should take advantage of that. Why not make the overpass 10 feet higher, raise all four tracks 10 feet, put in two center platforms (rather than have the side platforms there today) and leave the Lander pedestrians at level grade with pedestrian tunnels under the tracks? That would be much more accessible than making pedestrians go up an overpass and down 40-50 steps to the platform. That would let pedestrians on Lander stay level. No sidewalks would be needed on the Lander overpass. Most importantly, building the massive access to three platforms is expensive to build and maintain, a major hassle for station users and transferring rail riders and prone to equipment failures. If there is only about 10 feet from the Lander sidewalk to the platform because the entrances are below tracks rather than above them, the slope appears gentle enough to not even require stairs or escalators or elevators — just 120-foot ramps. Even if it did require equipment, it would be so modest of a vertical change that it could be done with shorter escalators and elevators. Of course, I would prefer a track configuration that would make transfers between the two lines across the platform from each other (Southbound Tacama trains on the outside and a new southbound flyover to connect back to the track entering the Beacon Hill tunnel). Still, this design refinement would make it so much easier to use this station for both those heading to this station as well as transferring between lines. I think ST is making a big mistake by not having the south end of the Midtown Station at Marion. Marion has the steepest gradient east of Third, which makes the walkshed along Fifth between Cherry and Madison the most distant vertically from the two Third Avenue stations. From Spring on north Third has risen significantly from Pioneer Square and Sixth actually starts to descend at Madison. Fifth pretty much flattens out. So at University there is relatively little climbing to do from Third to Fifth/Sixth. So the practical walkshed from University Street goes all the way to Sixth along University and Seneca. The practical walkshed from Pioneer Square really stops abruptly at Fourth where the grade becomes significantly steeper. But even more importantly, building a pedestrian tunnel under Marion would be much less disruptive than one under Madison. An extended access under the freeway is clearly the only way for First Hill to receive direct access to Link. Sound Transit will refuse to dig under Madison, though, for the good reason that the street is such an important arterial. Marion does not cross the freeway and is a leafy, pleasant street perfect as a pedestrian way all the way to Swedish. Extended access under the freeway, or a Hong-Kong like escalator system. Bonus if you design it to accommodate bicycles. Darn. The comment above should have been independent. Apologies. But I do have a reply to Al. In the absence of a Duwamish Bypass or Burien extension, you don’t need two sets of tracks down the busway. The Rainier Valley route is limited to a train every six minutes. Does anyone think West Seattle itself will ever generate more than that level of demand? An elevated trackway can easily handle three-minute headways. So keep the at-grade trackage for easy access to the MF from the north but run both the Green and Red lines on one pair of tracks with a stacked station at Lander. Platforms would be to the east of the tracks for possible future expansion as described below. That way in-line transfers don’t ever require crossing the platform and reversing transfers require only one level change. Having the platforms stacked allows the turnout to the Green Line to be much simpler than it would be in a four track design. The Green Line track would have to rise to double height in the block before Forest. With a stacked design, the upper level is already high enough to clear the tracks on the lower level. Also, make sure that the platforms straddle Lander so that bus-intercepts — there will still be a need for them — can be as efficient as possible, with three rights and one left per Spokane/4th or 6th/Lander/6th or 4th loop. If a Duwamish Bypass or Burien line is ever built, a second pair of tracks along the east side of the busway above the existing tracks. If they’re just used for access to the MF, a single track — the current northbound one — with a passing siding on the east side just north of Holgate could work, allowing the southbound track to be removed for the supports of the new trackway. Something would have to be done about the electrical towers. Also, the last paragraph should state that the Green Line would then use the second elevated structure with West Seattle/Duwamish or Burien the western one. It should stay stacked to Spokane street to allow free access to the MF from the Red Line along Hinds. Of course, interlining could be a great way to phase the construction at the SODO station. Even if it’s not logical in the long-term, it’s a viable short-term strategy until the capacities get exceeded. It’s going to be a lot less disruptive if there are at least two open platforms during the construction that could be used by either line. So why not first build the over pass, build two platforms (with track connections that could hopefully built quickly), shirt the exiting line to the two platforms, then reconfigure that existing side platforms to be a center platform that is higher (to allow for pedestrians to cross underneath everything to stay on Lander or get into or out of the station, as presented above). On another topic: I’m highly skeptical that the West Seattle “stub” will ever be operationally viable and I don’t see anything wrong with running three lines from ID to Northgate. The ST2 environmental documents actually assume a four-minute combined and eight-minute service plan for the two lines after 2023 anyway — so that it seems doable to find a way to have trains every 2 minutes and 40 seconds and put in the third train set, or simply take the other lines from 8 minutes to 9 . Of course, if West Seattle gets any sort of their “dream tunnel”, that will push back the line’s opening a few years anyway so the stub won’t be hardly useful at all. Al, thanks for the link. What a bunch of hypocrites! Every one of the three “Alternatives with more potential” consumes the E-3 busway. Every one. The “ST3 Representative Project” uses it for elevated supports while “Surface E-3” and “Massachusetts Tunnel Portal” consume it for trackway. Nobody has proposed “interlining” using the existing tracks. We’re not stupid. If MLK is limited to a train every six minutes because of cross-traffic conflicts, interlining on the existing trackage would be limited in the same way. There are three cross-streets along the busway. But “capacity constraints” are the primary reason given that interlining won’t work. The flying junction is a red herring, because we’ve always specified having (a) stacked station(s) for the shared segment. If the person(s) who suggested interlining at a workshop didn’t include that, it’s not our fault. Hey, ST folks, you read the blog. We know you do because ideas that appear hear magically migrate to your documents. Thank you for doing that, but you’re missing the boat on this. With stacked structures and stations, with platforms to the east of the new stacked trackway, you could continue to use the northbound lane of the E-3 as a reversible peak-direction facility. Grant, having it be reversible means that non-peak direction buses would have to take Fourth, Sixth or Airport Way, making boarding points different at different times of the day. But since these large volumes (60 buses per hour in the peak direction) are at least half peak hour express buses, they’re probably deadheading back anyway. Once Link opens to Federal Way, which is the timeframe for this project, the 594 will certainly change. And the 101 and 150 arewill have been tunnel buses so the loss of the E-3 would at this time slow them down significantly. But once they’re out of the tunnel and on Second and Fourth, moving to Fourth Avenue all the way to Spokane Street isn’t that much of a time penalty. In other words, midday service on the busway which is what would be affected by reversible operation is pretty slight. On the capacity constraint issue, if a Duwamish Bypass, grade separation in the Rainier Valley, or a Burien extension that increases Red Line loads is built, a second stacked elevated trackway just east of the platforms could be built for the Green Line. The end result would be that in-direction transfers would be cross-platform and reversing transfers would require only a single change of elevation. Don’t miss the forest for the trees. This is the best plan for the southern trunk: shared usage on a stacked structure until 2050 or so when new south-end capacity is needed and then a second identical parallel stacked structure across the platforms of the first. “here magically” not “hear magically”. Let’s make the same mistake we did with Safeco/CLink and the Airport. Let’s not serve the actual destination (Key Arena), but be just close enough to say it is served. People love unnecessary walks. Especially in the winter. Other cities get this right. When you take the subway to Madison Square Garden, you are there. No crossing train tracks and busy streets. I know people want this to be all things to all people but not serving destinations is a failure of Link. I hate to see is continue it here. Don’t forget about the unnecessary walks across busy streets at Mt. Baker and the upcoming one between the Bellevue Transit Center and Link! That’s what happens when “stakeholders” are made more important than the riders. It’s a structural problem with ST that needs to be fixed and it won’t get fixed until enough elected leaders realize the error of the agency’s ways! The actual destination is the entire Center grounds. People don’t just go to KeyArena, they go to Bumbershoot, the Opera House, the Science Center, the Armory (aka the Center House), the International Fountain, etc. I would say the actual destination is the neighborhood. The Seattle Center is overrated as a destination. For the amount of space it takes up, there really isn’t much happening there most of the time. The population density on average is very low. What is happening today, for example? I think school is in session, and that is about it. The peaks matter as much as the average. It’s the purpose of high-capacity transit to get people from all over the region to large events and back, even if they don’t happen every day. So what if the average ridership per year is lower than Capitol Hill Station? It’s probably higher than Rainier Beach Station. Madison Square Garden was built on top of Penn Station, approximately 50 years into its operational life. The analogy for Seattle isn’t putting a station at Seattle Center, it’s building a venue above Westlake Station. And the daily riders in the neighborhoods will always outweigh the passenger loads to Key Arena &co, no matter how many events you pack into them. Are you blaming ST for the airport distance? The Port wouldn’t let it be any closer. We can argue that’s the electeds’ fault for not cajoling them into allowing it but it’s hardly fair to lay that blame on ST as an organization. MSG was just an example. If you take Salt Lake City light rail to their arena, MARTA to Philips Arena, etc they put you right there. The crazy walks that we put up with for reasons are a failure of ST/the region. Other cities care about serving the destination. We don’t and we should start. The neighborhood is not a destination. Key Arena (and Seattle Center as a whole) is a destination. The airport debacle is a failure at many levels. ST is not immune from blame for that. The federal government wouldn’t let it be any closer. I recall something about post-9/11 skittishness. Also, the airport had an expansion plan calling for a new terminal near the station. I think I support the Dexter/Roy proposal for the second SLU station, assuming Westlake/Denny for the first one. It keeps stations more evenly spaced and feeds into a growing residential corridor along Dexter Ave. There is also ample opportunity for TOD in the area around that intersection, which without light rail is already a fast growing neighborhood. Just saying that in one town in Germany, streetcars also use convenient full railroad. In a place that already had both track both modes could use. Promised I wouldn’t but Google: Karlsruhe Tramway. But for Seattle, one idea is always wrong. That even with the most sternly reserved lanes and signals, buses can substitute for light rail re: either speed or reliability. It snows. Fact it’s not very often results in undersized snow-clearance fleet. And the height of the average lane-reserving line of concrete won’t keep a truck off the track. Including a fire engine. Also, every kind of emergency response usually blocks nearby transit-way. MLK LINK- understanding that when it’s time for main-line rapid transit, present line will become fill-in. For now, I think it’s worth it to undercut every major street intersection, and make cars turn for the rest. Bus Rapid Transit, including Rapid Ride certainly has its place. But, maybe just one man’s opinion after ride from Fauntleroy Ferry to Downtown: A railroad track in same condition as pavement I rode would never pass inspection. So would like to see ride quality feature big-time in any Buses-Are-Just- As Good discussion. I see many comments on Monorail upgrades. I always get suspicious about it. I have watched, listened heard about and even voted on Monorail issues in the last 30 years. The only change I have seen was the Westlake Station change in the ’80’s which I think was a downgrade. I haven’t ridden it since 2002. That doesn’t mean I will never support any Monorail upgrade. I think the only way that any money should be spent on the Monorail is if the Westlake Link station integrates it well. I want to see the Monorail, original DSTT station and new Link station to be set up to work as one great transfer hub. I don’t see it being that way with a station on Sixth. If all 3 stations can be set up to transfer efficiently, I support the money spent on the Monorail. If it doesn’t then just leave it alone.